With sport classes and leagues from toddlers to teen, Casselberry Recreation has programs to help all kids stay active! Are you searching for new activities for your kids? Sports offer a great outlet for children to have fun and learn. Casselberry Recreation has many partners such as Greater Orlando Soccer Academy, Florida Youth Programming, and Little League to provide quality sport instruction classes for youth. Casselberry also hosts many other physically active programs for youth including multiple styles of dance, yoga, and martial arts. The Wirz Park Pool is a public aquatic facility that offers open swim and morning swim lessons. The pool is open 7 days a week, from 12 p.m. to 6 p.m. beginning on Memorial Day Saturday. Once Seminole County Public Schools returns to session in mid-August, the pool will only be open on Saturdays and Sundays from 12 p.m. - 6 p.m. and will close on Labor Day. American Red Cross swim lessons are available. 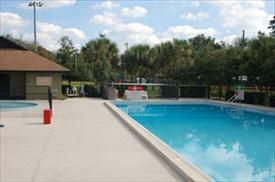 Call Wirz Pool at 407-263-7177 or 407-262-7700 Ext. 1576 for more info. *Family passes allow up to 6 guests at a time.